Cercis canadensis ‘Ruby Falls’ was selected for its attractive purple leaf color and weeping growth habit. Bred from stellar parents -- 'Covey' x 'Forest Pansy' -- 'Ruby Falls' is a breathtaking dwarf weeping-habit specimen, compact, elegantly formed, and ready to steal the spotlight from every other neighboring plant in your landscape! ‘Ruby Falls’ demonstrates excellent branching. 'Ruby Falls' has prolific dark rose colored blooms that arise before the foliage in spring on bright red stems and bracts. 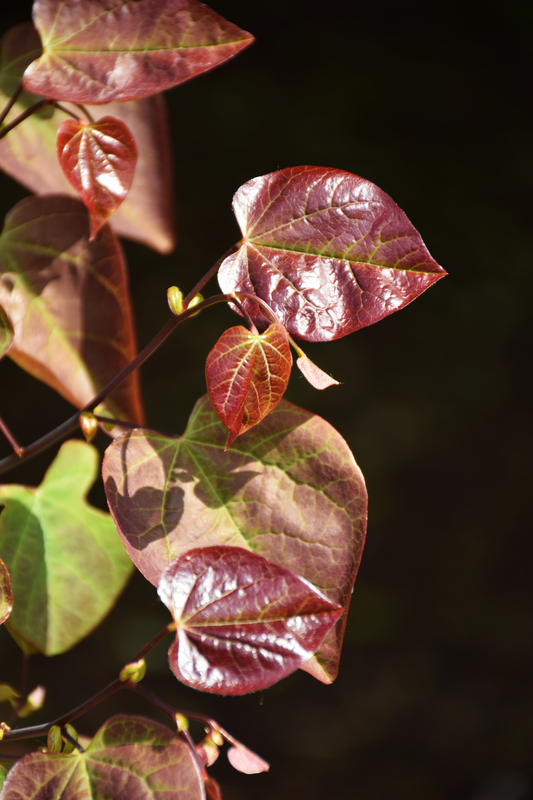 Very showy, they remain for several weeks before being joined by glossy, heart-shaped maroon-red leaves held on pendulous branches close to the central stem of the tree. As spring turns to summer, the foliage becomes burgundy before transitioning to green in late summer. And even in Winter, 'Ruby Falls' offers an elegant bare silhouette! Small yards will benefit from the elegance and small stature of 'Ruby Falls'. Benefits from partial shade and well drained soil. Do not overwater. Birds, butterflies and bees will frequently visit 'Ruby Falls'.